The Orthodox Church is very strong in Georgia, symbolized in the nation’s cross-covered flag. 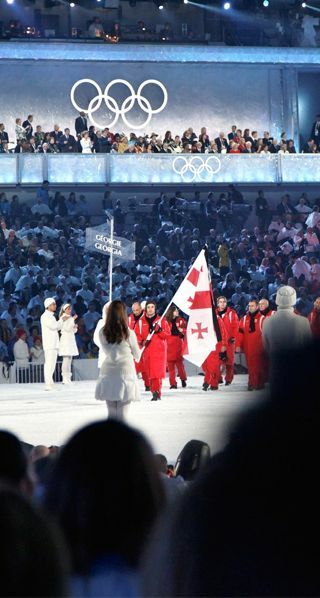 Here, athletes carried the flag into the 2010 Winter Olympics. Photo courtesy of Wikimedia Commons. Please help us to spread the news about a new documentary film exploring religious diversity in the Republic of Georgia. Across the many nations that emerged from the former Soviet Union, issues of religious and cultural diversity are daily challenges. The entire world is watching the ethnic conflict that has erupted in Ukraine in early 2014—but the story of diversity is unfolding in a more peaceful way in other emerging nations. I am listed as the producer of this new half-hour film, called Republic of Georgia: Finding the Voice, and I also appear in the film—along with many Georgian men and women—talking about some of the work we have been doing to promote religious and cultural cooperation in that region. The documentary was created by Michigan filmmaker and educator Christin Russman McKamey. You can follow her video work on the Starlet Creative channel of Vimeo, including short films on food, health care and other themes. I met Christin and her husband Robert Bruce, a professional photographer, through church connections in metro-Detroit and they wound up traveling with me to Georgia to work on this movie. You can share this story with your friends and with your congregation, school or community group by using the blue-“f” Facebook icon or the small envelope-shaped email icon. Email us via ReadTheSpirit@gmail.com if you are interested in a regional showing of this film, which is a great discussion starter. Republic of Georgia- Finding the Voice from Starlet Creative on Vimeo.